Leading cosmetic dermatologists from the Maryland Dermatology Laser, Skin and Vein Institute discuss upcoming trends in cosmetic dermatology for 2016. As 2015 winds to a close, the biggest trends in cosmetic dermatology are expected to not only continue but also to grow in popularity and demand in 2016. Minimally invasive and non-surgical techniques to achieve a youthful, refreshed appearance have taken center stage for cosmetic dermatologists. More and more patients sign up for treatments such as Cool-Mini ™and noninvasive body sculpting, injectables, lasers, and non-surgical skin tightening treatments. The dedicated board-certified dermatologists at the Maryland Dermatology Laser, Skin and Vein Institute (MDLSV) are anticipating patient demand to grow for these type of treatments as the population ages yet stays physically active, socially engaged and part of the workforce. “As improved techniques and technologies allow us to provide natural results with less need for downtime, we've definitely seen increased patient preference for noninvasive treatments of aging,” says Dr. Robert Weiss, board-certified dermatologist and Director of MDLSV. “Many patients choose to undergo a treatment that may not cause immediate changes, because the end results are worth it and there is little to no recovery time.” 2016 will be “the year of the neck”, adds Dr. Margaret Weiss, due to safer and more effective techniques to treat sagging skin and excess fat of the neck and chin areas. Dr. Karen Beasley points out that men are increasingly taking advantage of such noninvasive treatments. The following 10 treatments are expected to be the top requested in 2016. 1. Liquid Lifts: The most commonly requested treatment is still the winning injectable combination of neuromodulators (Botox™, Dysport™ and Xeomin™) and improved hyaluronic acid fillers (Voluma,™ RestylaneLyft™, RestylaneLips,™ Belotero™). Our advanced physician injectors expertly achieve natural results with minimal bruising. Any bruising can be quickly treated with vascular lasers to further reduce any downtime. 2.PicoSure™ Photorejuvenation: A less painful alternative to the well established Fraxel ™ noninvasive resurfacing laser with less recovery time, the Focused Lens Array allows a completely different type of treatment much gentler than the Picosure™ originally developed for effective treatment of tattoos. 3. Hand Rejuvenation: Radiesse ™ is the first FDA-approved filler to improve volume loss in the aging hand with long lasting results. Photorejuvenation devices such as Picosure,™ Fraxel™ 1927 and intense pulsed light effectively treat sun damage, spots and poor skin texture. Sclerotherapy can shrink enlarged veins. We customize treatment for each patient. 4. Cool-Mini™: Designed specifically for “double chins”, the Cool-Mini™ is the first of its kind, destroying excess fat under the chin by chilling it. The latest adaptation of the well-established and FDA-approved CoolSculpting ™ technology, it especially appeals to men because there is no visible recovery. MDLSV has long offered DualSculpting™ to cut treatment times of localized fat in half. 5. Kybella™: Kybella™ is the only FDA-approved injectable designed to shrink double chins. A series of injections of this fat-busting compound provides a gradual, yet noticeable transformation. 6. SculpSure: ™ The world’s first FDA-cleared laser treatment for non-invasive fat reduction of the flanks and abdomen, this state-of-the-art device uses a wavelength that effectively targets and destroys fat cells in just 25 minutes. A series of three treatments effectively helps patients get rid of stubborn fat deposits. 7. Noninvasive skin tightening: Using either radiofrequency heat (ThermiSmooth™, Exilis™) or ultrasound (Ultherapy™) , these well established techniques with no recovery time are very popular and effective for tightening loose skin of the eyelids, face, neck, chest and body areas. 8. ThermiTight™: Taking radiofrequency to the next level, ThermiTight™ delivers thermal energy through a tiny probe directly into sagging skin to tighten and smooth loose skin. The neck and under the chin respond very well as do other problem areas such as the arms, stomach, and thighs. Results are immediate and improve over time as the body produces more collagen and elastic tissue. The vast majority of patients see a noticeable improvement in contour of the treated areas. 9. ThermiVa™: Damage from vaginal birth, menopause, and aging can now be treated with the same controlled thermal energy used to noninvasively tighten loose skin of the face and body. Promotion of collagen remodeling and natural healing results in soft, supple, moist and tighter vulvovaginal tissues in the vast majority of suitable patients. 10. Improved Acne Scar Treatments: Infini™ combines radiofrequency technology with micro-needling to achieve breakthrough results with acne scars and other types of scars as well as stretch marks. Micro-Needling offers an economical, non-laser approach to promote collagen, elastin, and new skin growth by using a Collagen P.I.N ,™ which stimulates the surface layers of the skin. As the tissue heals, the body naturally repairs and improves acne scars, roughness, and sundamage. For indented scars, there is finally a safe permanent filler in Bellafill™. With a series of treatments, this unique dermal filler improves acne scars gradually with results that improve over time. 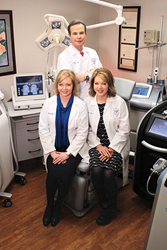 MDLSV is greater Baltimore’s leading medical and aesthetic dermatology practice. With over 45 devices and injectable treatments, our five expert board certified dermatologists offer comprehensive dermatologic and laser care, as well as state of the art noninvasive body contouring at MD Body Sculpting Center. For additional information and to schedule a consultation, please visit mdlsv.com or call 410-666-3960.